Nexus Real Estate sells the Atrium Building in Gouda | Nexus Real Estate B.V.
January 2018 – Nexus Real Estate has sold the Atrium at the Noordelijk Halfrond 10 in Gouda to the Hoornbeeck College. 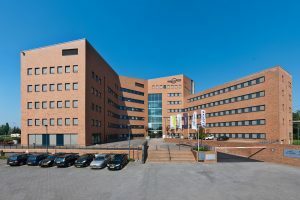 Since 2016, Hoornbeeck rented a large part of the former LeasePlan head office in Gouda for a long-term period. The building will now be transformed into an educational function. After th e Atrium Building became almost completely empty at the end of 2015, due to the departure of LeasePlan, Nexus Real Estate took over the management. In the beginning of 2016, the first discussions with Hoornbeeck College commenced and these initially resulted in a new lease for a large part of the building. Hoornbeeck College is an educational institution for secondary vocational education and has offices in Amersfoort, Apeldoorn, Goes, Gouda, Kampen and Rotterdam. Hoornbeeck College anticipates further growth of the organisation with this expansion of their school in Gouda. In particular the high-quality appearance of the building, the location within walking distance of the Central Station of Gouda and the expansion possibilities within this location, were reasons for Hoornbeeck College to choose for the Atrium Building. By transforming this building into an educational function, a significant part of the current office vacancy in Gouda will be withdrawn from the market and a striking building in Gouda will be given a new future.